The Tribal or Indigenous communities all over the world have been establishing the concept of peace and co-existence. They might differ with each other in terms of ritual but their belief living with peace is same. The difference might be a cause of living in a different geographical location, interference of non-tribals and increasing globalization or marketization also climate change can be considered as one of those reasons. But despite all this problem, they are still practicing their belief – peace and co-existence. And their belief is their own law or principle which governs their people. Santhal communities also practice such belief of peace and co-existence in their daily life which have been passed to them by their ancestors. Those beliefs can still be found in their folk songs and stories that still tell them how to live with prosperity and peace. Every Santal village when forms, the people there are by-birth are known to these facts which they find it very essential part of them and that is the main reason they are still existing without any conflict in them. 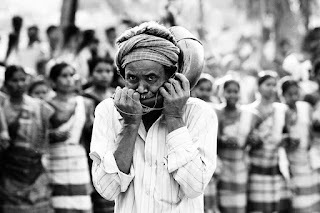 Their law or principle not just protects the right of Santal men and women but it also protects the rights of animals, forest, land, river, and mountain around them. A Santal man playing 'Sakwa' . We would like to quote 'Herbert Read' here which he wrote in 'On Justice'. Man in society is naturally just,because society, if it is real, is a bond of mutual consideration.Common law is essentially thecommon feeling of what is right and just, as between the member of a community. "The Santal village is organized to secure the greatest possible degree of co-operation not only in temporal affairs but also in dealing with the spirit world". The Santhal village appoints a Majhi which is a village headman, mostly this post is hereditary but sometimes people choose them with mutual consideration. Majhi has some assistant like Godet and Jog Majhi which assist them in need. Remember there is no kind of any election held in the village to appoint those people however it is the mutual consideration of village people which does. Like every tribal community in world Santhal community also is not any favor of centralization of administration. Majhi is always aware of what's going in the village and when the time needs he calls for a village meeting on call of people of the village. In any meeting, Majhi can not endorse or impose any decision on his own will. Instead, he has to consult people of the village and then he makes a decision on mutual understanding of people. This way the people regard his decision as the one voice of the village. The Jog Majhi which is appointed among the youth of the village who carries the feelings and problems of youth in the village. He also has some other important role to play in the village, He is appointed for a limited period and when his tenure is over the other youths are chosen. Majhi lives a simple life, besides being the headman of the village he is part of the people, he performs his duty on need and for this all, he doesn’t get money or treated specially for that. But people respect him for his duty. Majhi and his assistants take part in every event of village people’s life. Like co-operation of people in village forms a self-rule organization (Majhi Level) within the village, in the same way, the co-operation and organization of many Santal villages form a higher level of Social Self Rule system. Majhi-Pargana is the social institution of Santhals which governs the right of Santhal people and also deals with social issue among them. If you want to know about how Santhal villages are formed, and how they function, appoints their village headman, priest and also the role of these posts. You must consider reading this article: 'Composition of Santhal Village'.